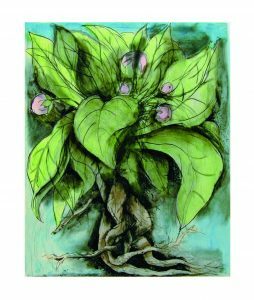 TUSCALOOSA, Ala. – A selection of contemporary fine art prints from the William and Sara Hall Collection will be on display at The University of Alabama Gallery in the Dinah Washington Cultural Arts Center April 10-June 10. The Halls donated the $1.5 million collection to UA’s Sarah Moody Gallery of Art in 2014. An opening reception and exhibition walkthrough with William Hall and William Dooley, director of the Sarah Moody Gallery of Art and associate professor in UA’s Department of Art and Art History, will be held Friday, April 10 from 5:30-7:30 p.m. at the gallery. The exhibit and reception are free and open to the public. Hall, originally from Red Level, Alabama, received a Bachelor of Fine Arts degree in painting from UA in 1973 and a Master of Fine Arts degree in painting and printmaking from the University of Texas in 1976. During his time at Pace, Hall worked with many internationally acclaimed and lesser-known contemporary artists including Jennifer Bartlett, Donald Baechler, David Bates, Richmond Burton, Chuck Close, Jim Dine, Tara Donovan, Helen Frankenthaler, Jane Hammond, Zhang Huan, Alfred Leslie, Robert Mangold, Kiki Smith, James Turrell and many more. A broad range of printmaking processes can be seen among the pieces selected for the UA Gallery installation. This exhibition was organized and produced by the Sarah Moody Gallery of Art with support from the Farley Moody Galbraith Support Fund. The University of Alabama Gallery offers a year-round schedule of exhibitions of artistic works, artifacts, textiles and more from permanent collections held by UA, as well as works by faculty, students, and guest artists and designers. The UA Gallery is located at 620 Greensboro Ave. in downtown Tuscaloosa. It is open Monday through Friday from 9 a.m.-5 p.m. and the first Fridays of the month until 8 p.m.
For more information, phone the gallery at 205/345-3038 or 205/342-2060. The UA Gallery, department of art and art history and Sarah Moody Gallery of Art are part of UA’s College of Arts and Sciences, the University’s largest division and the largest liberal arts college in the state. Students from the College have won numerous national awards including Rhodes Scholarships and Goldwater Scholarships.